"This brown rice pilaf is seasoned with onion, celery, raisins, fresh ginger, cumin, coriander, black pepper, and soy sauce." Bring brown rice, chicken broth, butter, and bay leaf to a boil in a saucepan over high heat. Reduce heat to medium-low, cover, and simmer until the rice is tender, 45 to 50 minutes; discard bay leaf. Meanwhile, heat the vegetable oil in a skillet over medium-high heat. Stir in onion and ginger; cook and stir until the onion begins to brown on the edges, about 3 minutes. Stir in the cumin and coriander, then stir in the celery and raisins. Reduce heat to medium, and cook until the celery becomes tender, about 5 minutes. Once ready, stir the onion mixture into the cooked rice along with the soy sauce; season to taste with pepper. Sweet, spicy and very hearty. Didn't have celery...used walnuts. Didn't have soy sauce...used teriyaki. Didn't have coriander...did without. This was very good. I used leftover rice that had been cooked with water rather than broth and it still tasted great. I had to add a little salt. The spices and the flavors throughout the dish are so satisfying. This is a great dish for an everyday meal or an elegant dinner for two. I followed this recipe as is...EXCELLENT! 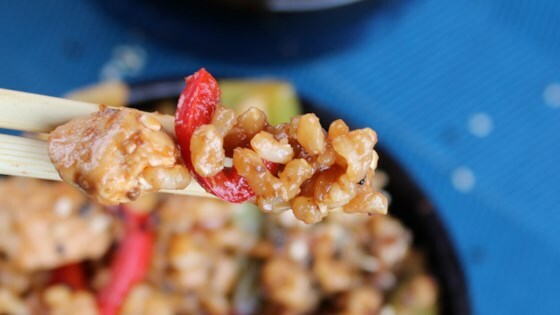 The flavors are such a nice mixture...my new favorite brown rice recipe! Thank You!